The past is always a fantasy world. Historical fiction, then, is intrinsically imbued with a sense of the fantastic; after all, to imagine a time or place that one has never visited automatically necessitates a certain amount of creative filling in of certain gaps. No surprise then that actual fantasy elements inserted into an authentically realized historical setting prove so palatable to readers, as recent novels such as Susanna Clarke's Jonathan Strange and Mr. Norrell (2004) and Elizabeth Kostova's The Historian (2005) prove by achieving both popular and critical success. Jesse Bullington's rollicking second novel, The Enterprise of Death , similarly mines the territory of historical fantasy, and the result is highly impressive. 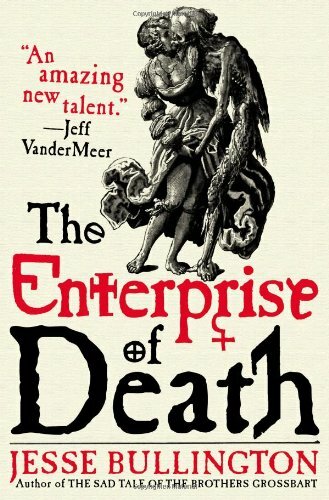 Breathtakingly grand in scope and achingly nuanced in detail, The Enterprise of Death is essentially a speculative investigation of the practice of necromancy in fifteenth century Europe, an environment largely preoccupied by the Spanish Inquisition. The novel blends history and fantasy in such a way as to feel true in every sense of the word. Lots of familiar supernatural beings pop up throughout the book—the expected undead, of course, are present in great number and variety, but there are also vampires, witches, soul-eating hyenas, and more—but the historical roots, and the narrative's interplay with the period's dangerously polarized political and religious factions, are what provide much of its heft. Opening in prologue with the surrender of Boabdil, "last Moor lord of the Iberian Peninsula, reduced to a suppliant outside his own city by a Spaniard sovereign, an exile from a home hard won" (p. 1), The Enterprise of Death effectively establishes the outsider context in which all of the novel's major players reside, be they Moors, witch doctors, eunuchs, brothel owners, prostitutes, mercenaries, necromancers, or even struggling artists, all of whom have been somehow conquered or displaced, or else otherwise relegated to a role in society deemed far less than honorable. The novel is centered around a young Moorish necromancer named Awa who is cursed to ultimately forfeit her human body at some future point when her master, who previously forced her into an unwilling apprenticeship, will return to claim it—that is, unless she can do something about it. The outsider theme takes shape as Awa's quest to un-curse herself, with the help of a few friends, provides much of the narrative's subsequent arc: not only is Awa a Moor and, according to the law of the Inquisition, a witch, but she is also a lesbian, not above carousing with the dead to satisfy her particularly powerful craving for love, and thus her outlook on the world is always one of someone who has not been granted access to society’s inner circle. Death, then, is not only perceived as alternately an ultimate threat and an ultimate relief, but it is also something to be manipulated, offering the possibility of granting agency to characters who are otherwise deprived of it by their cultural context. This is necromancy as revolution, and Bullington does not disappoint, especially with his dramatic final set piece on a battlefield where undead hordes battle undead hordes, rich imagery worth the proverbial price of admission. Death is less a theme or through line in The Enterprise of Death than a philosophical touchstone, at times a plot device and at others a mere hypothetical. Our first glimpses of death are on the battlefield when mercenary artist Manuel gazes down at a corpse which also happens to be his primary painting subject—Manuel, painter of the dead, to whom "everything looked like a symbol for something else, and because he was also a soldier most of the symbols he saw made him think of death" (p. 8). Death is rendered here in aesthetic terms, something to be studied, learned, and made beautiful. We continue to crosscut between Manuel's story, his struggle to satisfy his superiors in the military while also remaining true to his morality and his true vocation, and Awa's, as she forges a fraught personal journey from meek slave to powerful necromancer. Manuel and Awa begin their friendship when the former helps the young necromancer escape from captivity, endangering himself by putting himself in opposition to the Inquisition, and Awa subsequently protects him from harm by using her powers as a necromancer while also beginning to learn about the world which has positioned itself so adamantly against her. A former slave who then fell into the clutches of the necromancer, she has never been given the chance to live life on her own terms, and now so much is inherently unavailable to her due to circumstances beyond her control, and much of the novel chronicles her long struggle to figure out where she actually belongs. Much of the plot of The Enterprise of Death details the characters' reactions to these corrupt outer forces governing their lives. And these immediate difficulties are writ large in the context of human life under a corrupt regime: How are we to be good when the world isn’t giving us a chance? Why should we be good when we’re all just going to die anyway? Bullington assuredly helps us navigate these matters of life and death, unifying the novel's many threads into a cohesive whole. But just as "the real world is no romance, where all questions are answered, all conflicts resolved, all wrongs righted, all scales balanced" (p. 428), The Enterprise of Death does not provide all the answers to the questions it raises, nor does it even pretend to tell the whole story. The hints offered at the novel's end are enticing and provocative, but we are left to come to our own conclusions about the efficacy of the denouement offered to these characters, each having reckoned with their demons to varying results. But it turns out that that's what the enterprise of life is about: getting back up again, fighting even when it seems like the fight is lost. Bullington's novel ultimately provides a celebration of friendship, a reminder to treasure the people who carry us through this corrupt, unfair world—the same people who will hopefully see us through to the other side, to whatever may be waiting for us there. Richard Larson's short stories have appeared in Subterranean , ChiZine , Strange Horizons , and many other venues. He also writes film criticism for Slant Magazine , in addition to reviewing books for Strange Horizons . Visit him online at http://www.rlarson.net. Richard Larson's short stories have appeared in ChiZine , Electric Velocipede , Pindeldyboz , Vibrant Gray , and others. He also reviews books and movies, and he blogs at http://rlarson.typepad.com. He is currently a graduate student at New York University. I am hoping this novel gets more play, as it's one of the best I've read in recent memory; with luck, this review will convince a few more people to try it. Rephrasing, the political circumstances of the novel are that men have turned away from God and the world is awry. This premise is in no sense revolutionary, but deeply, virulently reactionary. I wish I could say I was surprised the reviewer didn't notice. I've never quite understood the fantasy novels that delight in real magic, especially the black kind, while blandly pretending that there is no true religion, even though all popular forms of religions claim equally magical powers. Satan without God is a jape, not a theme.